The Series 7 Chair was a product of its period because immediately after the war both high-quality raw materials, including timber for furniture, and men with traditional skills, including cabinet makers and upholsterers, were in short supply. A light plywood shell uses much less timber than a traditional chair with a frame in wood and the manufacture of plywood can make use of smaller and younger trees. With a light metal frame, all the parts for the chair could be made in a factory and then assembled … rather than the whole piece having to be made in a workshop by a cabinetmaker, a skilled artisan, shaping and finishing timber parts and cutting carpentry joints. For the Series 7 the light construction was also appealing as its style was a clear contrast to the heavy wooden furniture of the pre-war period and it resonated with a growing and wide-spread desire to be International - and so ‘contemporary’ and not obviously of a specific country or recognisable style. 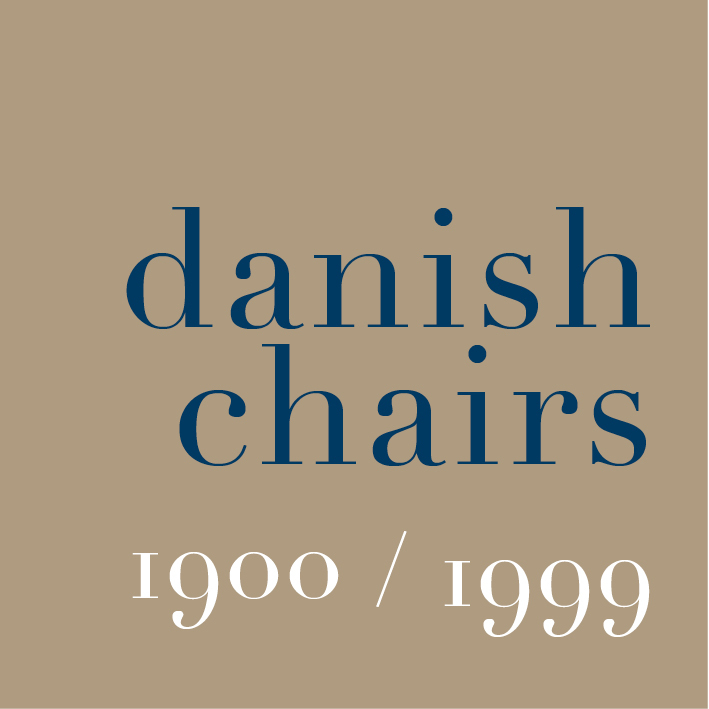 Carsten Thau and Kjeld Vindum, in their book on Jacobsen, suggest that the architect himself preferred a version of the chair with arms and the company also produced Chair 7 with a swivel base. 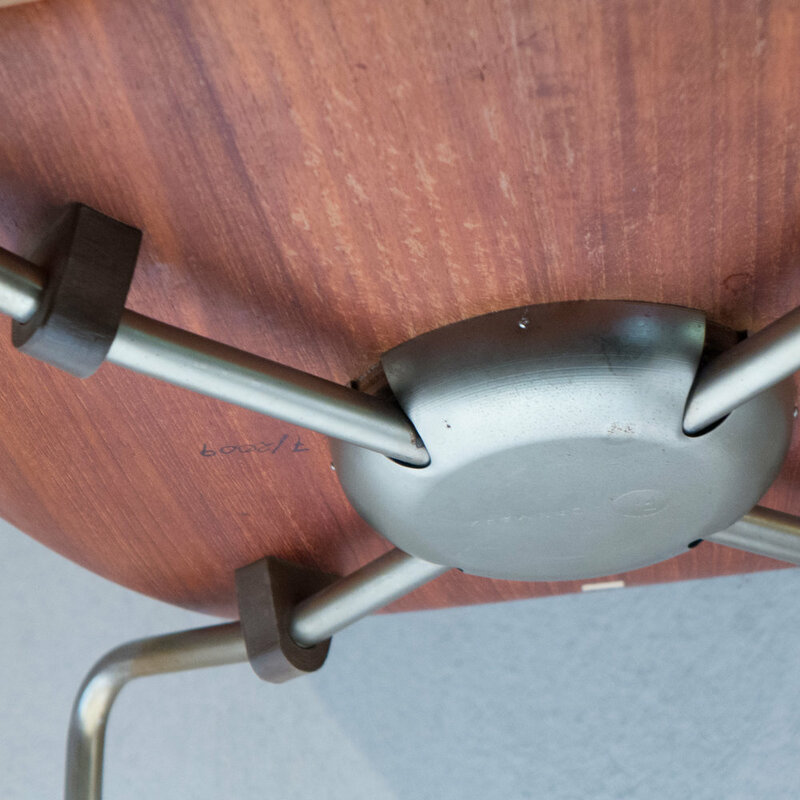 All these versions were used in Rødovre City Hall, just to the west of Copenhagen, that had been designed by Jacobsen and also completed in 1955 so from the start the chair was sold for both commercial and domestic use and the design was even scaled down as a version for children. Those first chairs were available in oak, teak, palisander and black or could be upholstered with fabric or leather. In 1968 Jacobsen himself selected new colours to extend the range with the moulded shell then available in grey, red, curry, green, blue, dark green and white. Fritz Hansen later introduced further new colours, notably a new range of nine colours chosen by the artist TAL R to mark the anniversary of the Series 7 in 2015, but there have been versions recently in pink and in very dark blue, for the shell and the legs, as well as versions with legs with a different metal finish to the standard chrome including one option now with a brushed or pewter look. To mark the 60th anniversary, seven architects, designers or design studios were asked to reinterpret the design and it was interesting to see how designers, many with well-established reputations in their own right, approached the challenge … Zaha Hadid replaced the four legs with three tight loops of metal; Neri & Hua produced a love seat; Jean Nouvel Design a striking black and white love seat, with two chairs linked together but facing in opposite directions; Bjarke Ingels a shell on top of a stack of seats, like strudel pastry or a certain make of potato crisps, and from Snøhetta there was a shell without legs but set in a miniature Nordic landscape. There are many reasons for the continuing success of the design. Clearly the design is flexible with almost any permutation of colour possible and several different forms of upholstery but perhaps the most obvious reason is its aesthetic appeal … the shell is a beautiful shape with a simple sensuous outline that Jacobsen described as organic. But that shape was not just about aesthetics - it was also very practical. Shaping the piece to cut into a narrow centre or waist meant that the seat and back could be curved in two directions … early plywood chairs were curved only in one plane to form what was in effect a scroll for the seat and back. To be able to curve the shell in two planes makes the chair much more comfortable so the shape of the back supports the full width across the shoulder blades and the curve in the vertical plane, between back and seat, provides good support if you push your bottom back into the seat and sit upright. The seat is curved gently down across the width but there is also a tighter curve downwards of the front edge which means the seat does not stick in the back of the legs but it also gives the front profile a visual weight that makes it look more robust or stronger than if you saw a sharp thin front edge that was just the thickness of the plywood and that curve also hides the housing for the leg unit. That point where the four legs meet is important for the strength of the chair and for the way it has some give or flexibility as you sit down. It is a matter of balance … too rigid and the seat would feel like sitting on a plank and too flexible and the chair would rock or give in a disconcerting way. Series 7 is remarkably light but remarkably strong and with that it’s very practical because the arrangement of the legs and the fact that they are slightly splayed means that the chairs can be quickly and easily stacked and stacked high in relatively large numbers so they are good for temporary seating in lecture theatres. Towards the outer edges of the seat are blocks that hold the legs in place but these also act as spacers when the chairs are stacked so the seats are held level and do not scratch or mark the seat of the chair below. There is a circular plate of plywood underneath the seat that reinforces the seat and gives it slightly more rigidity but also gives greater thickness for fitting the leg unit without carrying that thickness further across the seat. In contrast, plastic shells can have gradual or even sudden modifications of thickness for strength or extra rigidity or for sockets for legs or arms or whatever but an essential and inevitable feature of plywood is that it is a constant thickness … for the Series 7 the plywood is 9mm thick. Plastic rather than plywood for the shell would have been possible in 1955 - the famous chair with a plastic shell by Charles and Ray Eames was designed in 1948 and in production by 1950 - but would have been more expensive to produce as it required an investment in expensive and highly specialised machines and although chairs in moulded plastic are now common and popular, in the 1950s and through into the 60s and even later they were considered by many to look slightly cheap and be inappropriate in a home although perfectly acceptable and with clear advantages for a school or a canteen. With their very thin almost spidery legs the Series 7 probably looks better as one of a group - so around a dining room table - rather than standingalone but also looks good in rows. Perhaps this is the key to it’s success. The design is flexible and works well in a variety of settings and for a wide range of uses … the standard plywood shell can be used with a wide variety of bases, including a swivel unit, so it can be used in an office and the shell can be fixed to a horizontal rail or bar in a lecture theatre with fixed seating or even fixed directly to a step in raked seating. The elegant shape of the back means that they get away from the solid, block-like appearance of most cinema and theatre seating. Why has the Series 7 Chair had such a wide and long-lasting success? In part it has benefitted from good marketing. Each succeeding generation at Fritz Hansen seems to be given the task of re packaging the chair. The design is simple, so in some ways it can become what the buyer wants, helped by considerable flexibility in the number of permutations so wth a good coat of paint in a strong colour it looks great in a school but with an expensive veneer, matt metal legs and squab cushions in the best leather it can be used with an expensive table in the most sophisticated dining room in an expensive home. But there are other less tangible, less easy to define qualities. Jacobsen was an architect rather than coming through the traditions of cabinetmaking and furniture design, so what was important to him was how the chairs looked in the space of a room. The design is novel but not extreme; still distinct and immediately recognised but that does not seem to have restricted its appeal and its not a heavy and aggressive and masculine look but not overtly feminine either. Does that make it a compromise … be it an incredibly elegant and much admired and very popular and commercially successful compromise but never-the-less a compromise?